A police officer has been wounded with a gun shot in the US city of Ferguson, Missouri, a St. Louis suburb still gripped by public outrage over the killing of an unarmed teenager by a cop last month. The police have cordoned off the crime scene. The police have reported that the two suspects fled on foot. K9 officers and police helicopters are searching the area. Local police have earlier described one suspect as a black male with dreadlocks. The chase took place outside the Ferguson Community Center. The officer had reportedly blocked a bullet with his bicep, reutrning fire, but not hitting either target. With mounting public distrust for the police following the initial early August incident, the gathered crowds refused to take any explanation by the authorities at face value. “A police officer has been shot tonight. That's the only person who has got shot,” Captain Ron Johnson told the crowd which had gathered near the crime scene. With trust eroded between police and the local community, people doubt the suspect - or suspects - are still alive. There are also reports circulating among the witnesses and citizen journalists at the scene that a civilian was shot or might have been killed by police, but the authorities deny such reports. “I'm going to ask you to leave, and I'm only asking you one time,” Johnson told an angry crowd of 100 people late Saturday. Parts of the crowd reportedly broke off to stage a separate protest at the Ferguson police headquarters, but the atmosphere did not escalate. It remains unclear whether the current shooting was in any way related to the protests that took over Ferguson following the shooting death of the unarmed teenager Michael Brown six weeks ago. More confusion still stems from the fact that the police couldn't seem to get the gender of the wounded officer right. 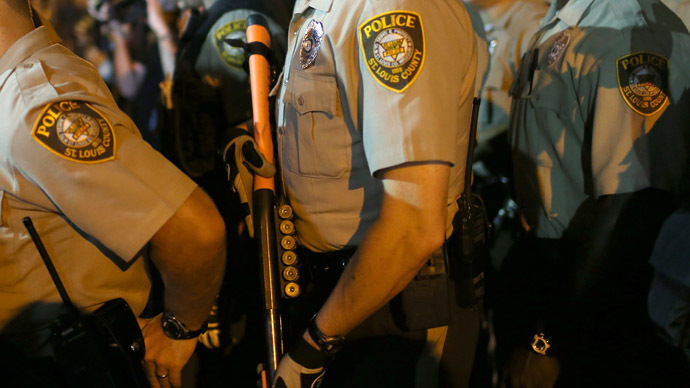 The St. Louis County Police and Ferguson Police gave different acconts. Furthermore, some reports indicated that the wounded officer was off duty, others that he was on a routine patrol when he witnessed a burglary and attempted to stop it. "[The suspect] returned with fire and the officer was able to block it with his arm," St. Louis County Police Chief Jon Belmar told local News 4. "The officer said he was able to get a couple of shots off. We have no indication that [the suspect] was shot." 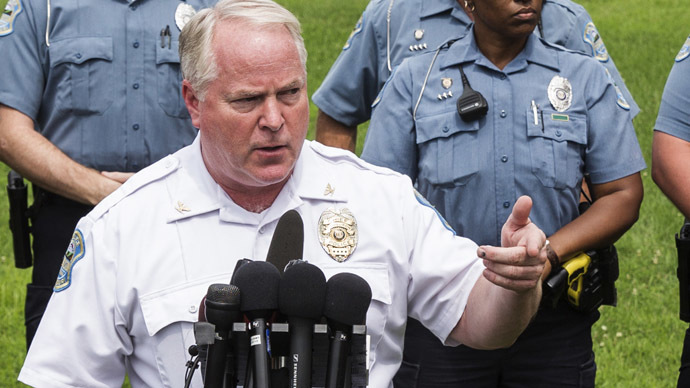 The chief likewise does not believe the shooting was in any way related to the Ferguson tension surrounding the August 9 shooting of Michael Brown by officer Darren Wilson. Presently, parts of the suburb of West Florissant are also on lockdown as the search for the suspects is underway. 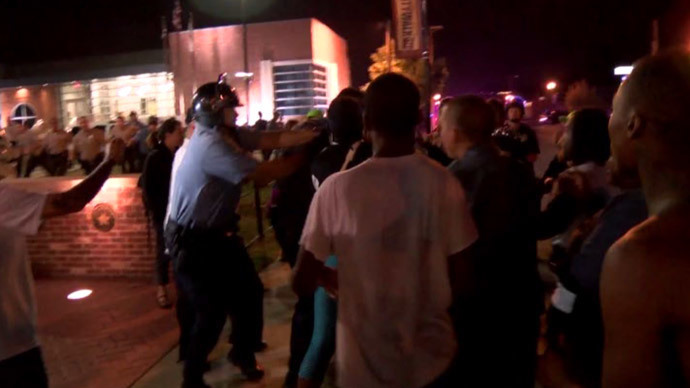 The initial incident sparked weeks of unrest in the predominantly black community of Missouri, while the highly militarized response to protests and demonstrations near the site of the shooting exacerbated tensions and galvanized the local population to call attention to racial grievances. Ferguson police, we will be waiting to see the video from your newly installed body cameras your officers are now wearing. Good night. Ferguson Police Chief Tom Jackson on Thursday appeared outside police headquarters in civilian clothes to assure protesters calling for his resignation that there would be reforms following Brown’s death. But tensions escalated when he tried to take part in a march in honor of the slain teenager. Four arrests were made as a result. The parents of Michael Brown said they were unmoved by Ferguson Police Chief Tom Jackson’s apology which he offered earlier this week, more than a month after their 18-year-old son was killed. 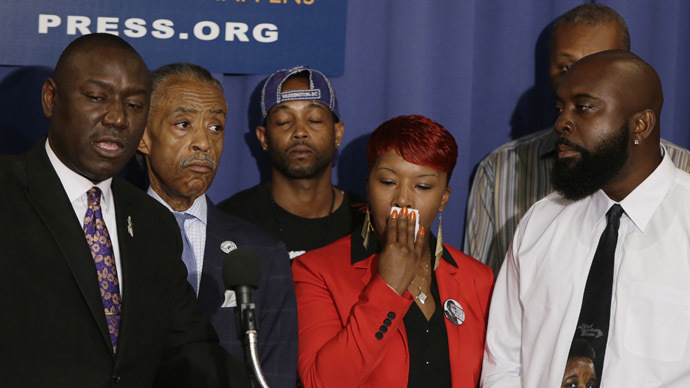 “An apology would be when Darren Wilson has handcuffs, processed and charged with murder,” Michael Brown Sr. told the AP, while Brown’s mother, Lesley McSpadden, said Chief Tom Jackson should be fired.